Mars and the last quarter Moon at 1 am local time from mid-northern latitudes, 3 October 2007. You've probably heard thatline before – no doubt fairly recently, thanks to a bogus e-mail thatunfortunately received wide circulation on the Internet this summer withpromises of Mars being as big as the full moon. But this fact is absolutelytrue: Mars, the only planet whose surface we can see in any detail from the Earth,is now moving toward the best viewing position it will provide to us until theyear 2014. Planet watchers have already begun readying their telescopes. If you haven't seen it, itwill be well worth looking for the red planet next week, even though you?llhave to wait until after midnight to see it well. 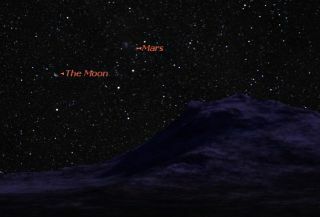 Mars is currently midwaybetween the zodiacal constellations of Taurus, the Bull and Gemini, the Twinsand during this week it will rise shortly before 11 p.m. local daylight time. Thereis certainly no mistaking it once it comes up over the east-northeast horizon. Presentlyshining like a pumpkin-hued, zero magnitude star, Mars is currently tied forfifth place (with Vega) among the 21 brightest stars. But as it continues toapproach our Earth in the coming weeks and months, Mars will only be gettingbrighter: it will surpass Sirius, the brightest star in the sky by Dec. 9 andduring the latter half of December it will even almost match Jupiter inbrilliance. Late next Wednesday night (ormore precisely, early on Thursday morning), Mars will hover about 7-degreesabove and to the right of the last quarter moon as they rise above theeast-northeast horizon (your clenched fist held at arm's length is roughly10-degrees in width). As you will see for yourself, the so-called "Red Planet"actually will appear closer to a yellow-orange tint – the same color of a drydesert under a high sun. Every 26 months, or so, Earth makes a close approach to Mars, asour smaller, swifter orbit "overtakes" Mars around the sun. Becauseboth the orbits of Mars and Earth are mildly elliptical, some close approachesbetween the two planets are closer than others. Thiscurrent apparition of Mars will be nowhere near as spectacular as theoft-referred approach of August 2003 when the planet came closer to Earth thanit had in nearly 60,000-years. Rather,on this upcoming occasion, Mars will come closest to Earth on the evening ofDecember 18th (at around 6:46 p.m. Eastern Standard Time). Theplanet will then lie 54.8 million miles (88.2 million kilometers) from Earth asmeasured from center to center. Mars will arrive at opposition to the sun(rising at sunset, setting at sunrise) six days later on Christmas Eve,December 24th. That recentMartian e-mail message – a hyperbole which was widely circulated for a fourthconsecutive year – lead people to believe, with liberal use of exclamationmarks, that on Aug. 27, Mars would appear as bright as (or as large as) thatnight's full moon in the night sky. The subject header urged viewers to prepareto view "Two Full Moons." It was amazing(and a little disturbing) to see just how many people actually believed thatMars could loom so large in our sky. But the truth is that even when at itsabsolute closest possible approach to Earth, Mars can appear no larger than1/72 as big as the moon; to the unaided eye it would appear as nothing morethan an extremely bright, non-twinkling star. When it comes closest to Earthon December 18th of this year, Mars? apparent disk diameter will be equal to15.9 arc seconds. To get an idea of just how large this is, wait until darknessfalls this week and if you have a telescope, check out Jupiter, gleaming in thesouthwestern sky; it'll appear about 35 arc seconds across. Incontrast, Mars? disk will appear less than half as big as Jupiter's when theRed Planet comes closest to Earth later this year. While this may sound small,keep in mind that this is still atypically large for Mars. In fact, fromNovember 30th through Jan. 5, 2008, Mars? apparent size will be larger than atany time until April 2014. Around the time that Mars is closest, amateurs withtelescopes as small as 4-inches and magnifying above 120-power should be ableto make out some dusky markings on the small yellow-orange disk, and perhapsthe bright white polar cap. From Dec. 15 through Dec. 29,Mars will blaze at magnitude -1.6, a bit brighter than Sirius, but justslightly inferior to Jupiter. Mars will still be positioned between Taurus andGemini, at a rather high declination of about +27-degrees. So almost as if to compensatefor its relatively small apparent size, Mars will literally soar in the nightsky of late-December. When it reaches its highestpoint in the sky at around midnight local time, its altitude will be 70-degreesat Seattle, 76-degrees for New York, and an exceptional 83-degrees at Los Angeles. Meanwhile, amateur and professional astronomers stationed in southern Texas and central Florida will see Mars pass directly, or very nearly overhead!